HOT! J-curve Jewelry & other beautiful jewelry from the Smoky Mountains. Therapeutic Copper jewelry, Magnetic Jewelry for stimulating & circulatory, crafted silver jewelry and ceramic sport jewelry on leather cord. Any would make a great gift. 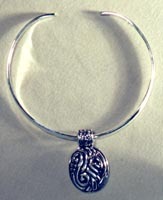 Uncle Bubbas has several styles of jewelry to choose from. Magnetic Bracelets - Helps stimulate the central nervous system and promote healthy blood circulation. The role of applied magnets have been known for hundreds of years. 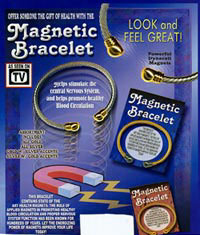 Look and feel great with the powerful Dynacell Magnet Bracelet. All are gold and silver plated. Expertly crafted Silver Triangle Necklace - This expertly crafted silver necklace may be the perfect gift for a friend or yourself. Ceramic Bead Necklace - on leather cord. Get a football, baseball, soccer or basketball pendant. Buy 3 get one free! Enter Uncle Bubba's Store to order your jewelry online.